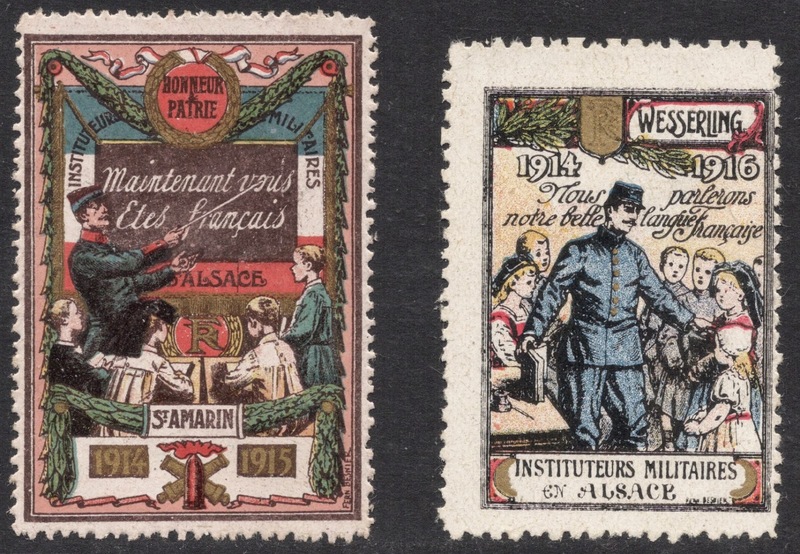 My Peacemaking collection on the aftermath of the Great War has finally been enlarged with another chapter, this time on Alsace and Lorraine. The fate of these provinces would be determined by the outcome of the Great War. And yet they don't really feature that heavily in my story, because it has always been a prerequisite that they should be returned to France. But let’s go back a few years to look at the history of the area. The provinces of Alsace and Lorraine were a part of the Holy Roman Empire but were annexed by France in the 17th century, when that empire started to crumble. Fast forward to 1870 and we see the German Bismarck occupying the two provinces during the Franco-Prussian war. That's where they enter my story and mainstream philately as well. During the occupation, a set of stamps was issued for civilian use within the two provinces. 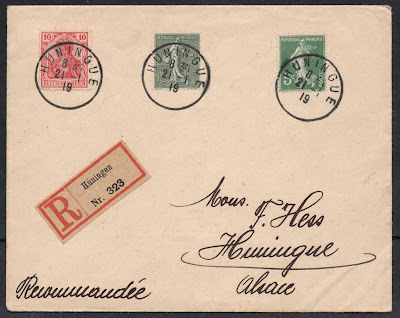 They are no things of beauty, but they offer a wealth of specialisation with various design varieties, reprints and an immensely interesting postal use, especially on mail to the rest of France. However, here we can make do with just a basic set and they’re hard enough to find in good mint condition so I only have the two values yet, but I’ll persevere! 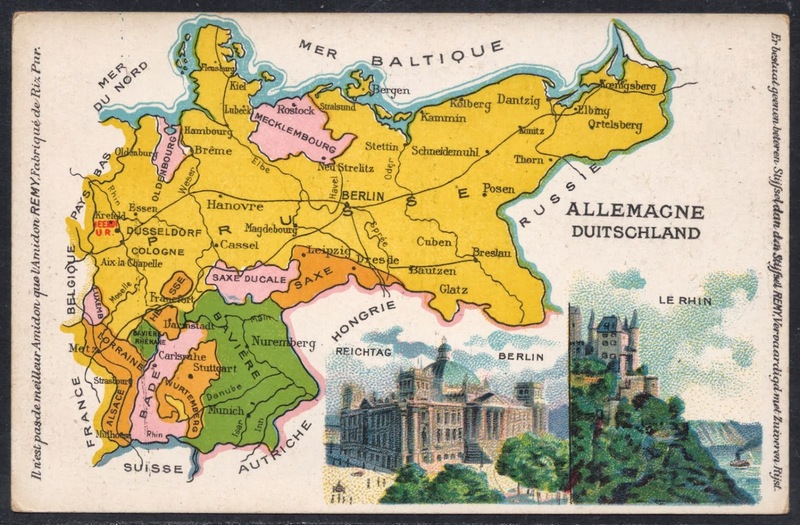 After the war was over, victorious United Germany was granted possession of the provinces so they became properly German, as can be seen from the above postcard which shows the two provinces in the bottom left corner of Germany. 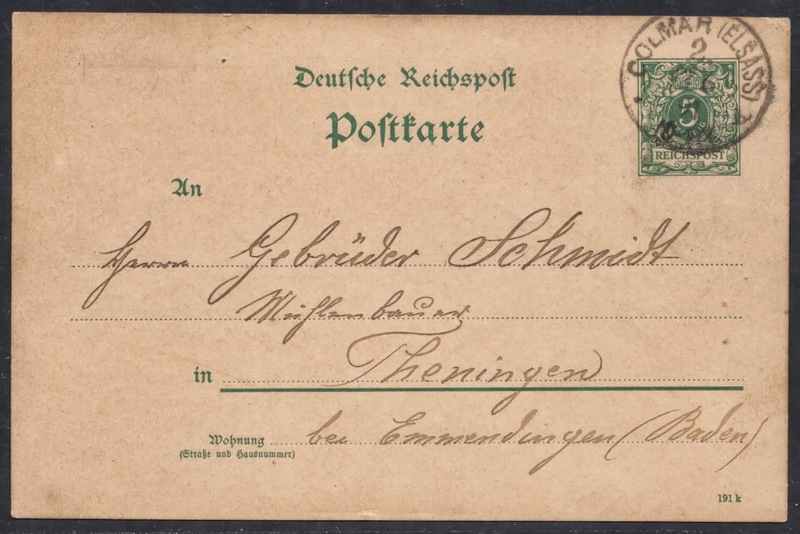 The occupation stamps were replaced with contemporary German stamps, see below postcard sent from the Alsace. France vowed to get back their provinces and this played a major part in the peacemaking process after World War I. As soon as France managed to occupy Alsace and Lorraine, they started to reintroduce French culture. This was often done rather ruthlessly and seeing that the provinces had been inhabited by Germans for a long time now, the French methods of persuasion led to resentment. These two cinderellas show how Alsace school children were forced to speak French and told they were French from now on. Left: "From now on you are French". Right: "From now on we'll speak our beautiful French language". 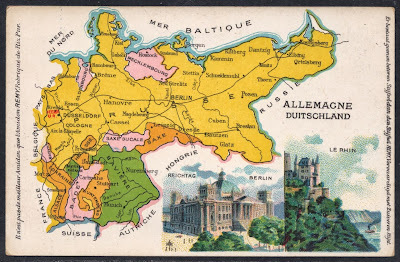 But, even though so many other regions in Europe were granted plebiscites to decide their own future, the inhabitants of Alsace and Lorraine were given no such privilege, because the French argued that the Germans had ousted all the French and had flooded the provinces with Germans which would impact the outcome of a plebiscite. And so, the provinces became French again after the war, with this 1919 cover symbolising the transitional period. Both German and French stamps are used and whereas the registration label is still in German, the postmarks are already in French. Also, the cover is written in French but the surname is as German as it comes! What a wonderful occupational stamp. It is very well centered, clean, and looks not to be a reprint. Most of my stamps are very poorly centered, and used (although one does have a beautiful 23-5-1871 Lorraine cancel.) To me these are very special stamps, as historically they are believed to be the very first "military occupation" issues. Thanks, Michael! Yes, most copies of these stamps are dreadful or have no gum, so I have spent ages looking for a good looking copy. I also made sure I had a 'points up' copy because the reprints are nearly all 'points down' copies. I thought that would be a safer bet than asking the (perhaps not so knowledgeable) various sellers. I never knew these were regarded as the first military occupation stamps, that's interesting! Other than avoiding the points down, the easiest way to determine reprints is to draw an imaginary line from the upper left corner of the rectangular border to the lower right corner. The line should pass through the lower part of the ‘P‘, while on reprints it will pass just below the center of the ‘P’. 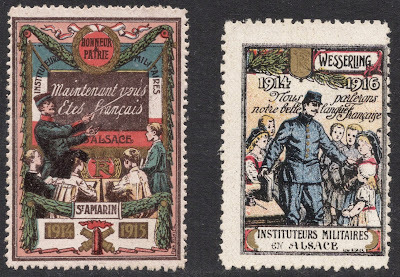 You can see examples of both on album page for Alsace & Lorraine, German Occupation during the Franco Prussian War (1870 – 1872) at www.DCStamps.com. 1. Official imitations have the network with points downward. 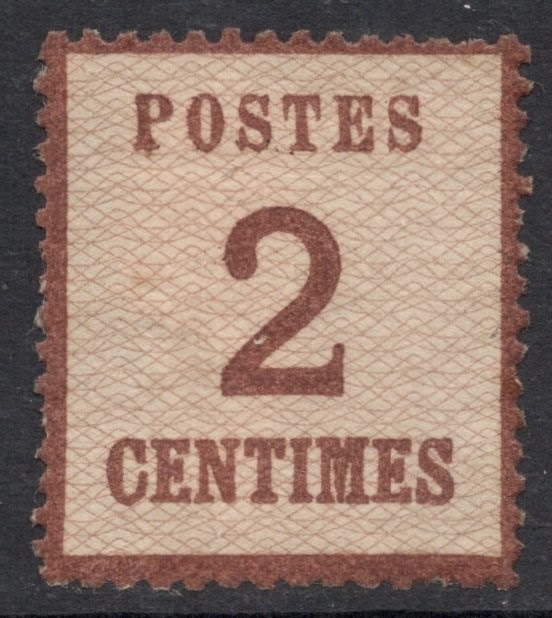 The “P” of “Postes” is 21/2mm from the border in the imitations and 3mm in the originals. 2. The word “Postes” measures 12 3/4 to 13mm on the imitations, and from 11 to 121/2mm on the originals. 3. The imitations are perf. 13 1/2x141/2; originals, perf. 131/2x141/4. I can scan them so they can be posted here. Thanks for the elaborate explanation. If you want to share scans of them, I think the website's forum would be a better place for that. You'll find the link on the top right of this page, just below my pic.